In a report published today, the Met Office said the recent decrease seen in the rate of warming was the result of natural variation in the weather and pollution. Scientists say one of the major reasons for the decrease in global warming is the rise in heavy industry and pollutant 'aerosols', particularly in Asia. An upsurge in industrial emissions such as sulphur which are being pumped into the atmosphere could reflect sunlight and lead to a cooling effect. Changes in the amount of water vapour in the stratosphere may also be a factor, the report suggests. The admission will be seized upon by climate sceptics as evidence that man-made global warming has been overstated. Since the 1970s, the long-term rate of global warming has been around 0.16C a decade but that slowed in the last 10 years to between 0.05C - 0.13C depending on which of the three major temperature record series are used. Vicky Pope, head of climate science advice, said: 'The warming trend has decreased slightly. There's still a warming trend but it's not as rapid as it was before. 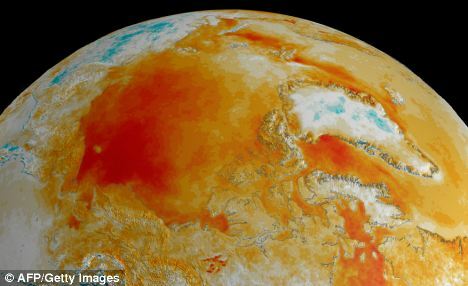 However researchers from the Met Office say there is still a warming trend over the 10 years since 2000 and the decade was the hottest on record. They also said a lack of data from the Arctic, where warming has been particularly strong in the last 10 years, and changes to the way sea surface temperatures are measured have led to an underestimate of the rate at which temperatures are rising. And while the UK is currently experiencing a cold snap and last year had the harshest winter for 30 years, the scientists said the evidence for man-made global warming had grown even stronger in the past year. Dr Pope said for global warming it was important to look at the global picture - which last year saw many parts of the world experience very warm temperatures even while the UK was gripped by snow and ice. Ahead of the next round of international talks aimed at securing a deal on climate change, the Met Office also said the 12 months to the end of September were the second warmest on record - while another analysis by scientists in the US indicate the year was the hottest ever. Partly this is due to gaps in the temperature data from the Arctic, where there is evidence warming has been stronger than other parts of the world. The Met Office does not make estimates for areas where there are gaps in the Arctic data, instead leaving them out, which would leave their overall results for global temperatures on the low side. And changes to the way sea surface temperatures are measured - with a shift from predominantly ship-based measurements to the use of buoys drifting around the oceans in the past 10 years - led to an underestimate of temperature rises.